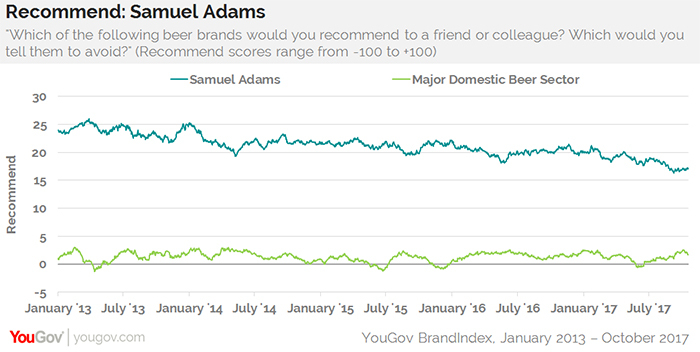 Sam Adams seems to have lost its craft beer mojo across a number of key perception metrics these past four years, with a flood of recent competitors apparently eating away at its dominant position, according to YouGov BrandIndex. The measurement gap between the craft beer pioneer — usually placed atop YouGov BrandIndex’s annual St. Patrick’s beer rankings — and the major domestic beer brand sector has been shrinking as a result. Sales have been flagging too: in 2016, parent company Boston Beer’s operating profit was down 12% from the year before, with its flagship Sam Adams brand causing much of that decline. The brand’s Quality, Recommend, and Impression metrics have been slipping steadily since 2013. Although their scores are much higher than the major domestic beer brand sector, the gap between the two is slowly closing. The gap in Recommend scores ("Would you recommend the brand to a friend?") has shrunk the greatest among those three metrics. However, it is a fourth metric which may trouble shareholders the most: Purchase Consideration, YouGov BrandIndex’s measurement of potential sales revenue. 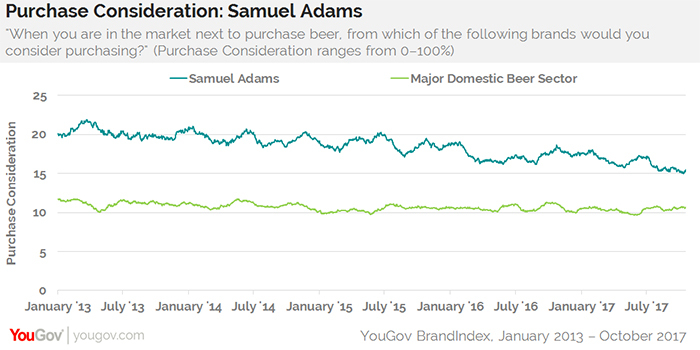 In January 2013, 20% of adults 21 and over would consider purchasing Sam Adams the next time they were shopping for beer. That percentage is now 16%, compared to the major domestic beer brand sector average of 11%.